The colour tables are used in gvSIG Desktop to represent both raster data (for example, a Digital Elevation Model) and vector data (they can be applied in legends such as unique values or heat maps). By default gvSIG Desktop has a small catalog of colour tables. But most of the users don’t know that it’s very easy to add new colour tables. Do you want to see how easy it is? First of all you have to know that the colour tables used by gvSIG Desktop are stored as xml files in the ‘colortable’ folder, inside the ‘gvSIG’ folder. So, if you delete some of these xml, those tables will no longer be available in gvSIG Desktop. 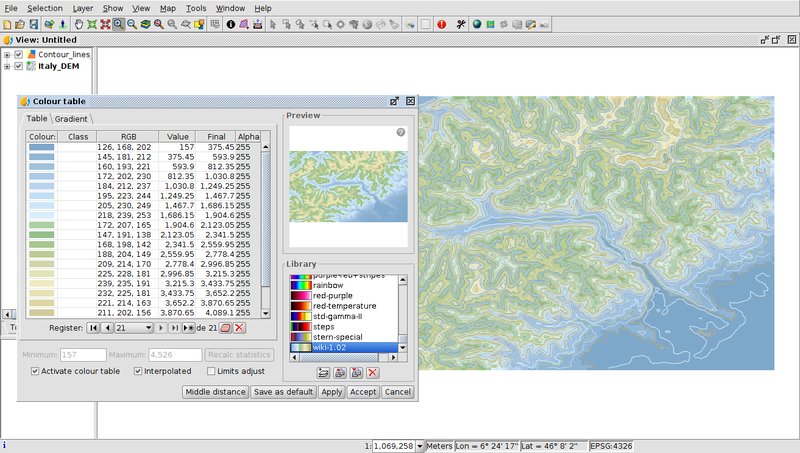 Let’s see now how we can add new colour tables in gvSIG Desktop. As you will see that website contains hundreds of colour tables, many of them applicable to the world of cartography that can be downloaded in a wide variety of formats, including ‘ggr’ (GIMP gradient) format, supported by gvSIG Desktop. We will download some of the colour tables offered in that ‘ggr’ format. We launch the tool ‘Colour table’ in gvSIG Desktop and in the new window we press the button ‘Import library’ … .then we select the ggr files that we have downloaded and we already have them available. Finally, in the video we will see how they can be applied to raster and vector data once imported. And if you want to download ALL the colour tables in ‘ggr’ format and in a zipped file… they are available here. This entry was posted in english, gvSIG Desktop and tagged colour tables. Bookmark the permalink.